Signup here & get notified about sales, offers and new products. This robust and compact, clam-style heat press is the recommended option for new start-up businesses, anyone who needs a reliable heat seal press for low-volume use or those looking for a back-up heat press. To ensure that you get the best price and value for money for your Stahls heat press purchase, along with the best possible after-sales support based on over 30 years of heat press experience, WE GUARANTEE TO MATCH any price offered by a UK-based reseller of Stahls and Hotronix heat presses – In the event that you find the same heat press elsewhere for a lower price, simply contact us to let us know and we will happily match it! 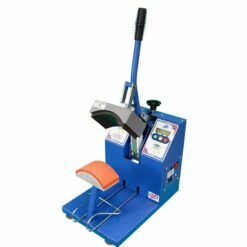 Designed by Stahls’ and built to their high standard, the Clam Basic is not only a great value heat press, but offers all of the features you’d expect from a much more expensive press, such as digital time and temperature readout and over-the-centre pressure adjustment for even pressure. An ideal heat press for a start-up business, low-volume users or as a back-up press. Digital LED display to adjust time and temperature settings easily. Easy to operate, with minimal knowledge required. Space-saving clam heat press design. Over-The-Centre pressure adjustment for even pressure. ¾” thick non-stick coated upper heat press plate. UL, ULC, CE and RoHS compliant. Made in China to the high STAHLS’ heat press standards. Additional lower heat press platens available to purchase separately. To find out more details on any of the products and services that we provide, please feel free to fill out our easy-to-use contact form to Request More Information. Alternatively, you can also contact us via email or telephone and one of our friendly team will be more than happy to respond promptly to your email or take your call and provide any information or further assistance that you need. We can be contacted by telephone any time between 9am – 5pm, Monday to Friday on 01253 349917 or drop us an email and we aim to reply within 24 hours of your email being received. Still Wanting Answers That You Can't Find? If you're new to heat pressing, or are looking for more advice and support, take a look at our Frequently Asked Questions or our Heat Press Blog to see if we can help you to find the answers that you're looking for. Our FAQs contain lots of helpful and useful tips regarding Heat Press Machines, how to choose the best product for your needs and some great application tips! In addition, our Blog will be regularly updated with advice and product information. We're also availble to contact via email or telephone if you can't find the answer on our website.